The Sapporo Dome (札幌ドーム, Sapporo Dōmu) is a stadium located in Toyohira-ku, Sapporo, Japan, and is primarily used for baseball and association football. It is the home field of the baseball team Hokkaido Nippon-Ham Fighters and the association football club Hokkaido Consadole Sapporo. It is one of the planned football venues for the 2020 Summer Olympics, was the venue for the opening ceremony of the 2017 Asian Winter Games, and is a planned venue of the 2019 Rugby World Cup. The stadium was previously a venue of the 2002 FIFA World Cup. The Sapporo Dome opened in 2001 with 41,580 seats. This stadium hosted 3 games during the 2002 FIFA World Cup, Germany vs Saudi Arabia, Argentina vs England and Italy vs Ecuador; all three matches were in the first round. The Dome hosted the opening ceremonies to the 2007 FIS Nordic World Ski Championships on February 22 and hosted the closing ceremonies of the championships on March 4. It also made history as being the first venue where both indoor and nighttime skiing events took place for the first time on a world championship or Winter Olympic Games level with competitions in the cross country skiing sprints (men's and women's individual, and men's and women's team) and the cross country portion of the 7.5 km sprint event in the nordic combined. In order to generate snow, the stadium used its turf conversion hovering system to facilitate the snow making process for the skiing competitions. The opening ceremony featured Maki Ohguro, a local artist from Sapporo, Japanese drum demonstrations and other performances paying tributes to local customs and traditions. For the championships, seating capacity was reduced to 30,000. The Dome was used as a super special stage in Rally Japan in both 2008 and 2010. In late 2009, renovations with the possibility of increasing the capacity up to 53,796 were finished. These renovations also included space for more food outlets, an extra video screen, two extra changing rooms (to accommodate preseason matches in the NFL International Series, which have up to 75 players per team) and further media area as part of new office buildings attached to the stadium. As part of these renovations, the surface area of the arena itself was decreased to allow for more seating. The Dome switches between two entirely different surfaces: Baseball games are played on an underlying artificial turf field, while football games are held on a grass pitch that slides into and out of the stadium as needed. Conversion from baseball to football begins with the storage of the baseball field's artificial turf. Once finished, a set of lower bowl bleachers rotate from an angled position for baseball to a parallel position. A set of main bowl seats on one end of the dome then retracts, and the football pitch is slid into the stadium. The lower bowl is then rotated 90 degrees. Conversion from football to baseball occurs in reverse. Due to the retraction of seats, the Stadium has a capacity of 40,476 for baseball games. 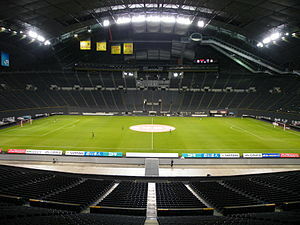 Other stadiums that feature sliding pitches include the GelreDome in the Netherlands, Veltins-Arena in Germany, the split pitch of London's Tottenham Hotspur Stadium, and State Farm Stadium in Glendale, Arizona, United States; however, unlike these four facilities, the Sapporo Dome has a fixed roof. Tōhō Line: 10 minutes walk from Fukuzumi Station. ^ "Sapporo Dome". j-league.or.jp. Retrieved 13 November 2011. ^ "Sapporo Dome". sapporo-dome.co.jp. Retrieved 13 November 2011. ^ "World Rugby approves revised Japan 2019 hosting roadmap". World Rugby. Retrieved 22 October 2015. ^ a b c FIS Newsflash Edition 112. January 31, 2007. This page was last edited on 2 February 2019, at 17:26 (UTC).